Tomorrow is Pi day! And what better to celebrate with than a unique pie? Obviously, this isn’t traditional pie, but it still counts. This torte has a walnut meringue “crust,” a homemade cherry filling, and some freshly whipped cream on top. Yum! It actually comes from a cookbook that our grandmother used, so it’s definitely got a retro feel to it (in a good way!). It doesn’t really slice too neatly, but every piece is delicious. Don’t be scared when you are looking through the ingredient list and see that it calls for crushed saltine crackers. You don’t taste them in the finished product- they just give a slight sweet/salty contrast. We think that some crushed graham crackers and an extra pinch of salt might be good in place of the saltines too. 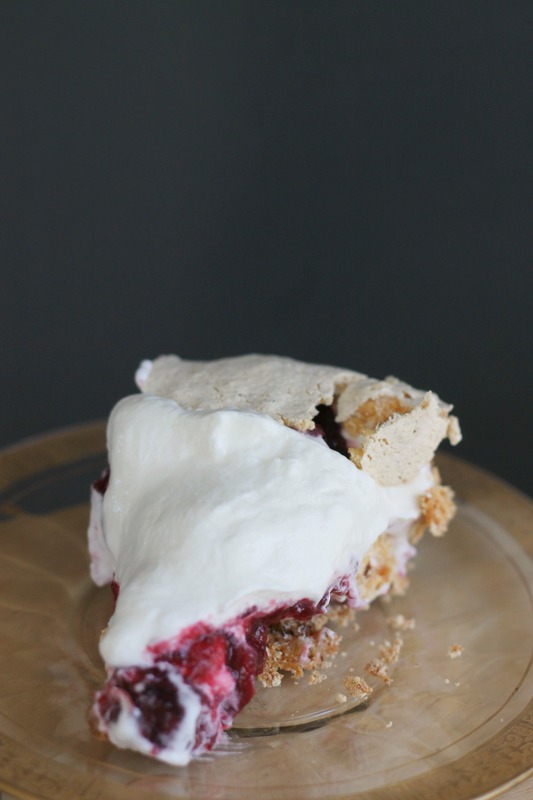 Regardless, we loved this pie and hope that you will too! In the bowl of a stand mixer, beat together the egg white, pinch of salt, and vanilla until foamy. Gradually add in the sugar, beating on high speed until stiff peaks form. Fold in the walnuts, saltines, and baking powder. 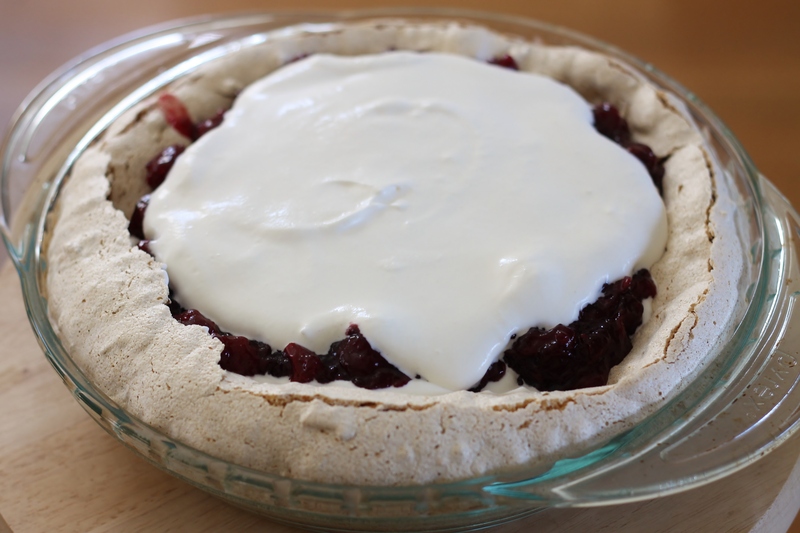 Pour into a greased 9-inch pie plate, and spread the meringue up the sides. Bake for 40 minutes. Let cool. Meanwhile, drain the cherries and reserve the syrup. Mix together 3/4 cup of the syrup with the sugar in a saucepan. Heat over medium until boiling. Add the cherries and cook for 10 minutes. Combine the cornstarch and another 1/4 cup of the syrup in a bowl until smooth. Add to the cherries. Cook until thickened; add more syrup if it gets too thick. Let cool. Beat together the heavy cream, sugar, and vanilla until stiff peaks form. To assemble, spread half of the whipped cream into the meringue shell. Pour the cherries on top. Spread the other half of the whipped cream on top. Serve immediately. Enjoy!